In this medieval themed RTS players rule over their very own castle, responsible for its advancement, upkeep and defense by training up a powerful army. The game has strong PVP elements where players will face off against each other for competition, prestige and prizes as well as being able to found Alliances and work together. Completely free to play it can be accessed through your web browser. Legends of Honor is a PVP focused MMO where players must balance their time and resource management to build up a Castle and train an army capable of defending it; with elements of PVE where players can target roaming bands of Marauders, at its core the game is about dominating and conquering your rival players. Players must multitask with their concentration and priorities being constantly pulled in different directions, finding the balance of spending time and resource to expand their Castle and construct or upgrade buildings, or continue to build up an army to defend it or strike down their foes. The game requires long term planning and strategy and elements of diplomacy where players will make Alliances with each other and challenge other Alliances for rank and reward. 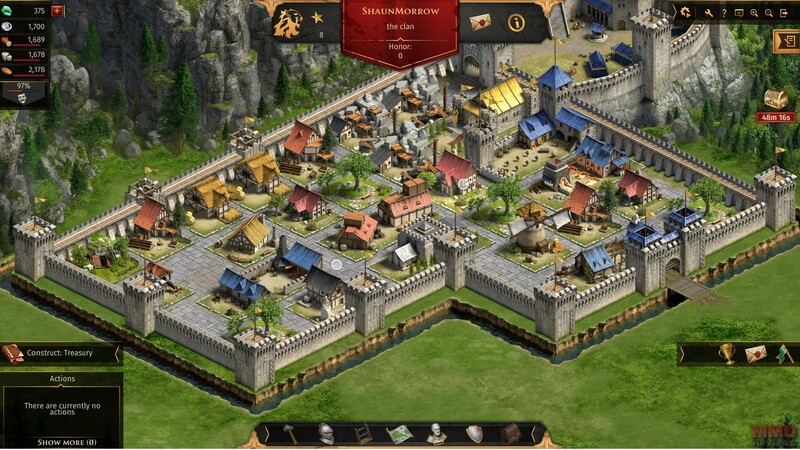 There are four main resources in the game that players need to acquire, either through quests, resource production buildings or by defeating opponents and looting their goods. The goods are Wood, Stone, Coin and Food, the initial three are used for most buildings and upgrades whereas food is an ongoing resource needed as maintenance for units. Players can earn a Gems resource by levelling up, but it is a premium currency that can be purchased with real money; Gems are used primarily to rush the production of buildings and recruiting of units, providing convenience instead of having to wait such a long time. Each player controls their own castle, an enclosed walled off area in the world where they can construct buildings, each building taking up a certain number of squares, however players can spend coins to expand their available land. New buildings can be added or players can upgrade existing buildings to make them more efficient. There are a variety of units that players can recruit; Axemen, Archers, Horsemen and more, each has their own offensive and defensive capabilities. Higher level units require the player to have a certain Honor rank, Honor itself is earned through being victorious in battle, and these Units can also be upgraded at a recruitment level as opposed to an individual unit (ie. once Axemen are upgraded then all subsequent Axemen will be a higher level). As well as units players are also able to create Unit Boosters, which will give extra buffs to any units within a group that the booster is applied to. Units are assembled into battalions that are commended by Heroes, each of which has their own profile and stats and can be equipped with a variety of gear items that are looted in combat and have Unit Boosters assigned to them. Heroes have an icon on the world map and allow players to move around larger groups of units in one go. Heroes can be moved around the map, visit a castle or make attacks on enemies. When attacking an enemy player, castle or AI unit, players can often attempt to assault the target to take resources and earn Honor, or they can fight for complete destruction where the two opponent units will fight to the death until only one side remains. Combat itself is completely automated with both Heroes being locked out on the world map once battle commences and a timer over their heads to show how long the battle will go on for. The games AI determines who will be the victor based off the units in both armies, their unit types and level, unit boosters and even the terrain that is being fought on. Looking for more Free MMO Browser-based games,Free MMORTS,Free MMOs games?